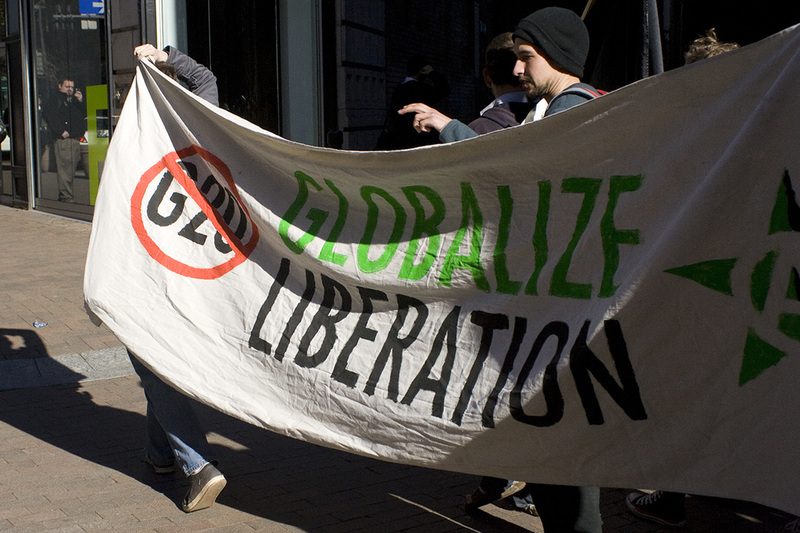 While protests of the G20 Summit in London turned violent last week, a more peaceful demonstration took place in downtown Pittsburgh. Pittsburgh Organizing Group arranged the protest, dubbed “Financial Fools’ Day,” which took place April 1. Members and supporters of POG gathered in Market Square at 4 p.m. before marching around downtown, stopping at several banks and government offices. The event started with speeches in Market Square. “Capitalism is dead and we are here to bury it,” Patrick Young, a member of POG, announced during a speech. After the speakers finished, the group of about 30 people marched through downtown, stopping at financial institutions such as PNC Bank and the Bank of New York Mellon. Outside the bank, security guards and police officers stood watch. Proceeding down Liberty Avenue, members of the group handed out fliers and spoke to people waiting at bus stops and walking down the street. Financial Fools’ Day was held to “oppose the G20 and any system that puts profit ahead of the planet and people,” according to POG’s Web site. The financial summit was not the only target for the protest. Members also condemned the International Monetary Fund, a frequent target of POG, and current worldwide economic policy in general. “We have been subjected to neo-liberal economic policies which have had a devastating impact on lives and communities,” Robin Alexander, Director of International Labor Affairs for the United Electrical, Radio and Machine Workers of America said. “The deregulation of banks is what permitted this crisis, which led to the bailout. This is a huge transfer of wealth from taxpayers to banks." After assembling outside several of these banks and airing their grievances, the protesters returned to Market Square before dispersing. The event was peaceful and there were no arrests.